Choose from over 20 templates and plans the ones that work best for your situation. If you do not have your own life plan, you will be part of some one else's. Live a life of consistent, daily intention Here are some basic life plans or personal development plan ideas and templates. More information and worksheets are available to members as the underlined items are activated links. A popular plan for most of us throughout our lives is to 'Reveal and Heal' - Know Yourself, Reveal Your Challenges, limitations and sabotaging behaviours and Heal Yourself. This clears the subconscious mind of limiting and sabotaging programs so your natural authenticity arises. Set goals for what is important to you and follow them. Use our BE-SMART Goals process or if goals do no work for you try our 'Evolving Essences' process. Daily aspire higher using the Feeling Finder and elevate thoughts, actions and feelings to new levels of intelligence, courage and compassion. Create and read at least once daily a Manifesto or Creedo page containing in large print your intentions, affirmations, goals and evolution on one page. If you are comfortable with where you are in life, try the Balance Wheel and work on the areas in your life that need the most attention. Use our one page, 5 minute Personal Dashboard that enhances the synergy of self knowledge, healing, intuition and consciousness raising. Align your purpose, vision, goals, values and actions on one page and review and embody them daily. Build your character, integrity and authenticity by knowing and living your values, strengths, skills and style. If you are unsure of your next steps, try one of our Smart Questions series, Personal Dashboards or Lists of Answers. Shift your focus from yang to yin, left to right brain, receiving to giving, lower to higher mind... or vice-versa. If you are on your spiritual journey create a plan for how your soul can work through your personality/ego. Understand and live by natural and universal laws. Or a simple and evolving strategy - just focus on raising your consciousness, so you naturally manifest your dreams, synchronicities, coincidences, insights and miracles. One ultimate plan, becoming more popular today, is just to 'BE'. Allow life to unfold, be aware, trust your intuition and make choices as they arise. 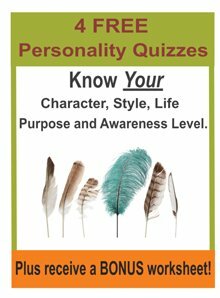 We also have other personal development forms that work on life progressions, life purpose, intuition development, your Soul Story, natural cycles, group work, the 5 W's and regular reminders to keep you more focused and on track. Test drive and pick the personal development plan that works for you using our "intuit and DO IT" Manifesting and Reminder System.